In his book, Living & Dying in Brick City—An E.R. 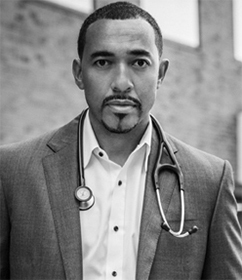 Doctor Returns Home, Dr. Davis discusses his life as an ER physician and offers his ideas for improving the health of the poorest communities. His previous co-authored books about his and his friends’ dreams of becoming a doctor, The Pact, We Beat the Street, and The Bond, were all New York Times bestsellers. His latest book, co-authored with Sharlee Jeter, is entitled The Stuff: Unlock Your Power to Overcome Challenges, Soar, and Succeed.